There is a fog that I've been fighting for a few weeks, months, not exactly sure. It's crept up slowly but steadily until it's presence can no longer be passed off as something I can easily wipe away each morning and focus fully and clearly on my day. I'm tired. Exhausted. Emotionally and physically. It is a constant struggle for me to get through each day with my head held high and a positive attitude in my pocket. I am okay - in the sense that you may be wondering about me now. I am okay - in the broadest sense of the term. But yet I'm still hurting. And fumbling through the grief, fears and worry that became a part of my life a little less than two years ago. Sometimes I catch a glimpse of myself in my wedding photo hanging on the wall in my family room. I find myself staring at it, at the picture of me - carefree and hopeful with my hair swept off my shoulders and a butterfly (the world) in my hand. I looked beautiful. And I'm not saying this to sound conceited. I'm saying it because I felt that way. I was at my best. I hate so much that looking at those pictures from one of the happiest days of my life often makes me cry. I see the look in my eyes - the pure and unknowing strength and confidence to take on whatever life might possibly throw my way - and I think about where I am now, what I've endured, how naive I was to think that life could always be that innocent. I spent 4.5 weeks on bedrest when I was pregnant with Ethan. A little longer during my pregnancy with Aiden. And each and every day from the moment I saw the two pink lines (or in Aiden's case the digital "Pregnant"), I prayed for a healthy child. 'Do you want a boy or a girl?' people would so predictably ask in the supermarket, at the doctors office, at work. 'It doesn't matter to me,' I'd reply. 'As long as it is healthy'. The night Aiden was born I was unforgivingly introduced to a world that was so foreign to me. Medical terms and jargon that had no place in my life nanoseconds before his arrival became commonplace. Words that once carried no meaning now seep out in everyday conversations. The night Aiden was born, for the first time, I fully understood the phrase I had been known to dramatically shout to my parents during my teenage years when I couldn't go on spring break or stay out past midnight. "Life is so unfair". Little did I know. Surprisingly, I was able to hold it all together quite well during the months after Aiden was born. In fact it never really crossed my mind to become depressed or to wallow in my pity. I was resolute. Determined. Steadfast in my thinking that a positive attitude would help me get through it all and that in itself would benefit my son to the greatest degree. It took me a long time to realize that during that time my whole self was on auto-pilot. I didn't think about being depressed because I didn't have time to. There were doctors appointments, surgeries, geneticists, tests. But no time to deal with what was going on all around me. I was strong. Still am. But with several months of not having to worry about every runny nose and whether or not it will stand in the way of my little boy having his next operation to give him separated fingers and toes, I now have the time to turn my thoughts on other things. Like being depressed. I guess you could say I am one of the lucky ones. I recognize that with all the ways my life has changed over the past two years I am pretty high up on the risk list for becoming depressed. So when I began crying more that I smiled and having stress-related chest pain that no healthy 28 year old should have, I pretty quickly self-diagnosed the fact that I might be battling more than just a case of the "blues". I seemed to have teetered through the stages and even "moved on" to the next, only to re-experience one of them once again several months later. That led me right into the anger and bargaining stage. During my pregnancies, I ate right (granted I understand that my craving for Sour Patch Kids was probably not super healthy). I started taking pre-natal vitamins several months before I knew we would try to become pregnant (and with Ethan being only 3 months old when I got pregnant with Aiden, I hadn't even stopped taking them yet)! I read every book. I followed every piece of advice. I stayed away from deli meat and stopped drinking caffeine. One could say that thinking about that made me angry. Very angry. I doubted God. I stopped going to church. I found extreme irony in the fact that our parish priest couldn't console us during his visit to our hospital room when Aiden was born because I was so angry at all things religious that it only made sense that this wise man of God couldn't find the words. That proved it. It had to all be a farce. God musn't exist. For the next several months I think I spent most of the time going back and forth between stages two and three. Then I quickly entered stage four and have probably spent more time there than I even realize or care to admit. However I do feel that I'm slowly approaching the "upward turn". When you think of grief in stages, it gives you a roadmap that helps you understand your feelings every step of the way. When my world fell apart, I somehow mustered up the strength to ignore my grief and get through some of the most difficult life experiences I hope to ever encounter. But I've learned that it is only after weathering the storm that you finally start to assess the damage. I'm no longer in shock. I don't deny what has been chosen for me and my family. Guilt, I'm done with. I'm through blaming myself. But pain, anger, I'm not sure that will ever subside. Aiden has proven so many of our fears wrong. His future is much brighter than I ever would have thought when I was just starting to digest the medical information given to me after his birth. I am more than hopeful. I am proud. I am happy. I love my boys more than life itself and the love that my husband and I share is immeasurable. I am very blessed. And I do know that God does exist and he does have a plan for me, for Aiden, for my family. It is so powerful and brave to bare your soul to others.Motherhood is the most rewarding hardest job there is.Loved this post Taryn! You are brave, amazing and inspirational, and you must also allow yourself to be human. Beautiful post. You made me shed a tear (or two) at work !! You are an incredible, wife, mum and 'still' beautiful girl about to get married! You have been through so much in the last 2 years, I can relate to so much of it, except getting pregnant when my first born was 3 months-that is pretty impressive! I also go through the pain/guilt sensation many many times - not so much daily now like I used to, but at least once a week I experience my thoughts beginning to slip down that dark slippery slope of 'imagine what it would be like'. The thing that keeps me from dwelling in that place for too long, is that I can see that my thought patterns or comparisons, only work to make me sad, envious or longing for something that is just not meant to be. Somehow, something in me pulls me away from dwelling their for more than a second or two. Maybe that is the grace of God, or some other force! I like to think we all have angels that watch over us. I then am struck by thoughts of this amazing little boy we have, and the people we have come into contact with because of him, and the unfailing smile and unbelievable strength he possesses. Somehow again, my thoughts then do a complete 360 and I can't believe our luck and our blessings for having been given him. When you're going to have a baby, it's like planning a fabulous vacation trip - to Italy. You buy a bunch of guide books and make your wonderful plans. The Coliseum. The Michelangelo David. The gondolas in Venice. You may learn some handy phrases in Italian. It's all very exciting. After months of eager anticipation, the day finally arrives. You pack your bags and off you go. Several hours later, the plane lands. The stewardess comes in and says, "Welcome to Holland." "Holland?!?" you say. "What do you mean Holland?? I signed up for Italy! I'm supposed to be in Italy. All my life I've dreamed of going to Italy." But there's been a change in the flight plan. They've landed in Holland and there you must stay. The important thing is that they haven't taken you to a horrible, disgusting, filthy place, full of pestilence, famine and disease. It's just a different place. So you must go out and buy new guide books. And you must learn a whole new language. And you will meet a whole new group of people you would never have met. It’s just a different place. It's slower-paced than Italy, less flashy than Italy. But after you've been there for a while and you catch your breath, you look around.... and you begin to notice that Holland has windmills....and Holland has tulips. Holland even has Rembrandts. But everyone you know is busy coming and going from Italy... and they're all bragging about what a wonderful time they had there. And for the rest of your life, you will say "Yes, that's where I was supposed to go. That's what I had planned." And the pain of that will never, ever, ever, ever go away...because the loss of that dream is a very very significant loss. But... if you spend your life mourning the fact that you didn't get to Italy, you may never be free to enjoy the very special, the very lovely things ... about Holland. Taryn, you and your family are inspirational. You make me push, strive and hope for more everytime I check in on your blog. As others have said, it's ok to be sad, angry, depressed. Thank you so much for sharing your experiences. You are so brave. Thank you so much for sharing this. We have to pass through those stages and fighting them just prolongs the whole process. You are so very inspiring. I am amazed that you were holding all this in while doing so much for others. I'll be praying for you and ask that you would keep me in your prayers as well. Taryn, I keep coming back to this entry trying to find the right words to post a comment. I still haven't. But I wanted you to know that this post made me think back to growing up together and sharing our hopes for the future. We started out in a very similar place having grown up on the same street and even though Aiden and Brian's disabilities are so very different, I often marvel in the fact that we have ended up in a similar situation all these years later and miles apart. This post made me ache for you and for Aiden. It made me ache for me and for Brian. But, coming back to it today it made me so happy for Aiden and Brian to have you and me to help them through this world. And it made me happy for me because I have you to look to when I feel like my world is falling apart. Many have said it, but I will repeat it. You are an inspiration. I am proud to be your friend. Taryn, thank you for sharing your story in such an open and honest way. People who do not live with a child with a disability often cannot imagine how difficult it can be. I admire you for sharing your thoughts with us and for carrying on each day with great purpose and love. Aiden will continue to amaze you and he will be speaking the same way as Ethan. I have lived it through Randy and it is the best feeling ever. I can totally relate to your feelings and you are an incredible mommy. Our kids are lucky to have us!! 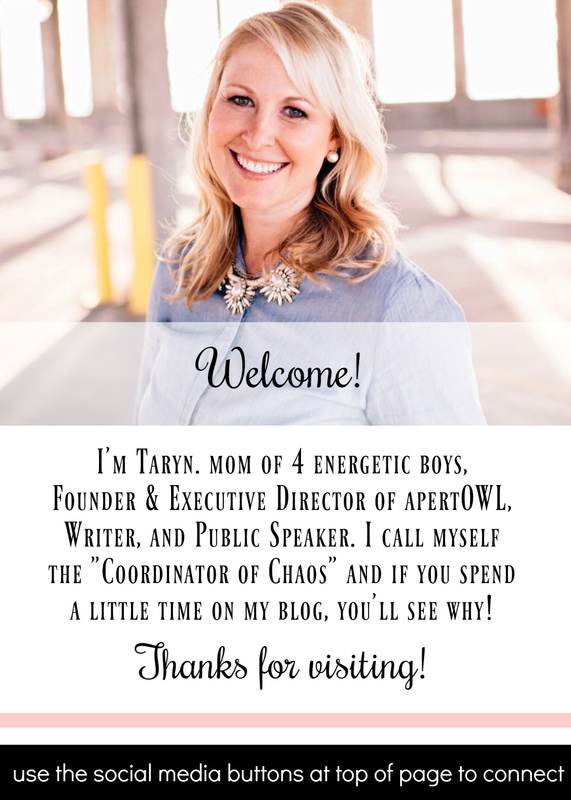 Taryn, your story and your candor inspire me. You are a fantastic mother and a great writer. Keep up the good work! Hope to see you at another Austin blogger event soon. It's official - we really ARE great parents!